Kern County Sheriff’s Office execute search warrant at Rosamond marijuana dispensary. On 04/12/2019, Investigators with the Kern County Sheriff’s Office Narcotics Unit, with the assistance of the East Area Substation Deputies and Wardens with the California Department of Fish and Wildlife, executed a search warrant that the Organic Health Solutions Marijuana Dispensary, in Rosamond. During the service of the search warrant, investigators learned of an additional nearby location in the 1300 block of West Rosamond Boulevard, which was related to the illegal dispensary. 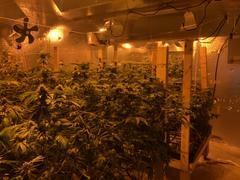 The second location contained an indoor marijuana grow and marijuana processing structure. An additional warrant was executed at the second location. -255lbs of processed marijuana with an estimated street value of $127,500.00. -4,952.1g of concentrated marijuana with and estimated street value of $99,042.00. -295 packages of marijuana edibles with an estimated street value of $2,950.00. Eduard Petrosyan (40) was arrested for maintaining a business for the purposes of sales, illegal sales of marijuana, cultivation, and conspiracy to commit a crime. Petrosyan was booked into the Kern County Jail pending court proceedings.